Liver and Onions with Paulo Coehlo! 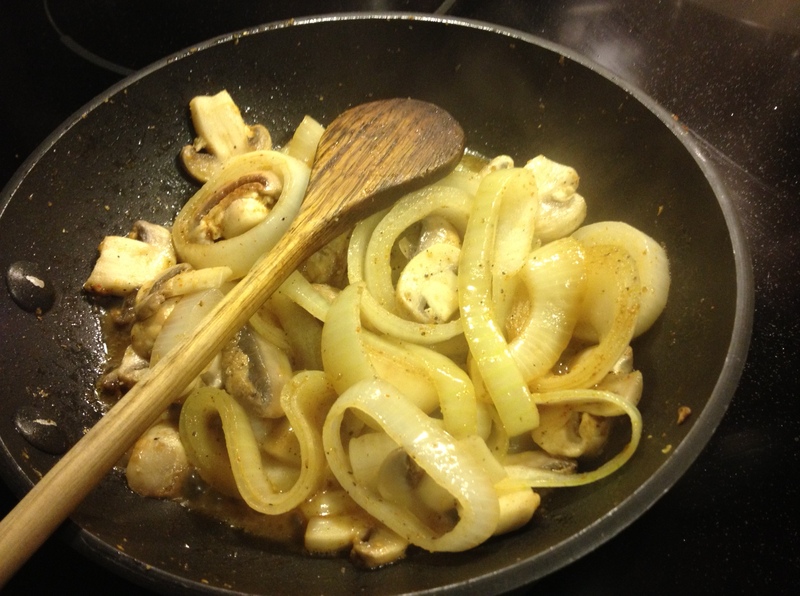 I recently had some liver and onions, and ENJOYED IT. 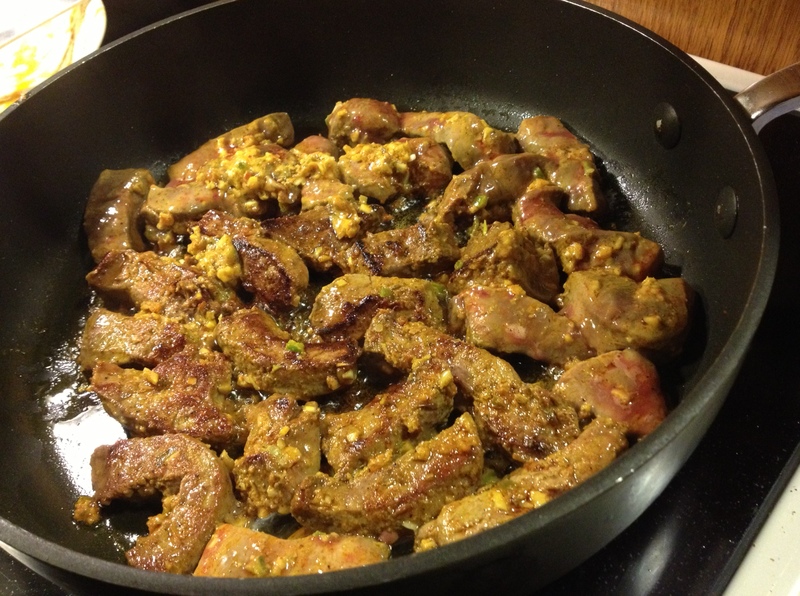 My mother in law makes a really tasty version of liver and my husband recently made it. This has been a journey for me. I never thought I’d even encounter liver let alone try it. But when I met Jayesh, I realized very quickly that he is not a picky eater and he LOVES good food. So I decided to just put my concerns aside and eat whatever he presented to me. When I first tried liver, it was a bit chalky and the texture threw me off, but I’m an open minded person and figured it must be an acquired taste. I gave it several tries. The spices that my mother in law puts on it are really good, so I concentrated on those flavors rather than the mineral flavor. Somewhere down that road I stopped tasting the liver taste and actually enjoyed it. I think it was when I took a second helping that Jayesh noticed I was really enjoying the meal. It surprised me, because typically I’m battling through each bite and trying to find what I like about it. This time I just liked it and kept going. I hadn’t even realized it. We both started talking about why I even bothered with the liver if I didn’t enjoy it the first time. I just wanted to share that with Jayesh. I never wanted him to feel like he couldn’t do something or enjoy something because I didn’t. I did it for love. Not for anything in return, but simply for Jayesh’s benefit. Not too long after this, a good friend of mine approached me with an excerpt from a Paulo Coehlo novel. She presented me with some questions and told me to take a look. I did. I wanted to share my response and the excerpt with you, because the idea is worth sharing. Love is a powerful force. It allows us to experience things we never would have, it gives us strength, builds us up. At the same time it can be destructive and disappointing. Love can change your mind, open your mind, and get you to like liver! How do we tap into this power and really benefit from it? Below you’ll find the link to the excerpt, my friend’s questions, and my response. I’d really like to open this discussion up and hear what you guys have to say about it. a) What do you think about this in general? b) Too ideal? Is love so mythical/magical? Isn’t reality so much more practical? c) People do things for love and we try to make the other person happy. Are actions used to ‘seduce’, then, illegitimate? Where do you draw the line between being loving (ie doing loving things for someone) and using love to get things (ie be loved back)? d) Do you think Paulo Coelho over-values love? Is he making to big of deal of what it means in life to an individual? In general, I agree with this 100%. A while back I started reading books written by Dr. Brian Weiss. They are about past life regression and hypnosis used to retrieve our soul’s experiences. One of the books really opened my eyes. I happened to finish reading it a while before meeting my husband. This book is called ‘Messages from the Masters’. You should read it, it’s enlightening and really opens your mind up to this concept that love is the strongest and most important force in our lives. After reading this book I allowed myself to just love, in it’s truest form. That is, love without expectation. This doesn’t just go for romantic relationships but relationships with friends as well. People in general. I started to not expect anything from anyone and just did things because I wanted to, because I cared. I found that I could really care for people. At first it was difficult because not everyone is as kind and giving and it takes time to break that habit of expecting something in return. But I powered through and realized that I found joy in making others happy, and doing things for others. Soon I found myself surrounded by positivity and it seemed to be contagious. People in my life were kind to me because I was kind to them. So my relationships became stronger and better. Of course I still encounter negative people, and people who are just so cynical that they question my motives or wonder why I’m being so nice to them. But those people have a ways to go on their journey and I can’t judge them because I was once in their position. I find that I don’t have resentment, anger, jealousy, all the negative emotions associated with unmet expectations. When I met Jayesh, I was able to completely fall in love because that’s what my heart was feeling, not because I was expecting something in return. At that point, to me it seemed that whether he loved me right away or the same amount didn’t matter. I was open and loving and 4 weeks after meeting he asked me to marry him because he said he’d never experienced such an unconditional love from someone. I never pressured him to fulfill any voids because I didn’t have any. I was content, because I had spent all that time before meeting him allowing myself to be full of love. It changed me as a person. To this day our love is strong because we don’t have resentment. I think 10 years ago if I had seen a friend of mine get flowers from her boyfriend I would have gotten jealous. Asked myself ‘why is my boyfriend not doing that for me, there must be something wrong with him or me’ But this is toxic thinking and represents what is most wrong about relationships these days. The expectation. I don’t ever expect anything from my husband, I just love him and show him that I care, because I want him to feel loved. But I don’t expect that if I do something for him that he should do that for me in return. This has made it easy for him to show his love in his own way. He isn’t pressured, he’s allowed to open his heart and express love the way he knows how to. I don’t think it’s idealistic, this idea of unconditional love. I think the world we live in doesn’t allow for trust and faith. Which are the two things it takes to love like this. I trusted my husband with my heart and I had faith that sooner or later he would love me back. There’s two kinds of people in this world. It can be seen most when meeting a stranger. There’s the kind of person, who, upon meeting a stranger, will be skeptical and not let the person in right away. They may keep their distance and be a bit rude until this person has given them a reason to be kind to them. Then there’s the kind of person who embraces everyone and is kind and trusting right away until the other person gives him or her a reason to not trust him or her. I think the latter find it easier to love the way Paulo Coelho is describing. The people who have those trust issues and cannot embrace people right away, give people the benefit of the doubt, those people I find have the hardest time sustaining a relationship because their hearts are closed. Love being mythical or magical, I think that’s an interesting choice of words. Magic is an illusion, it is not what it appears to be. Myth is something that exists only in our imaginations or is fictitious. So I don’t believe that to be true of love. I think love and the power of love is very real. Most of this passage talks about having faith and even when things seem dim to know that the possibility of love and returned love is there. We just have to keep loving and being positive. It’s the same message as telling someone to remain positive even when the chips are down. To know that God has a bigger plan for us. Everything is meant to be, it is unfolding as it should, etc. What is practical or not is up to the individual. When you say reality is practical, what is your reality? Some would say it is practical to just openly love one another and spread that positivity. It is wasted energy to be negative and dwell on things, or to formulate and scheme. I think it takes less effort and energy to just love one another than it does to be negative. This is difficult because not everyone is on the same page and most will take advantage of someone who gives so openly. It then becomes important for the open person to discriminate between good people and toxic people. Your question about doing things for someone is a good one. I think it’s important to consider motive and intention. Of course we try to seduce our partners, to get their attention. But I think it’s more important to understand why we do things. Did you just cook your boyfriend a big meal and rub his feet because you want to convince him that he should marry you, or did you do it because you know how much he enjoys that particular meal and you know he’s had a long day and would like him to relax? Did you say ‘I love you’ first because you wanted to hear it back, or did you say it because that’s how you feel and you need the other person to know how much you care for them? I think it’s fairly easy to analyze our actions. Are we doing something because we expected something in return or did we do it to simply elicit joy in the other person? I think Paulo Coelho is right on the money with this excerpt. It only sounds like a big deal when you have been so far removed from the concept that it starts to sound idealistic and unrealistic. Love has so many forms, it isn’t only romantic. This particular excerpt answers a woman’s question about love always passing her by, however it can be interpreted to fit the love we have for our family, friends, and the love we should have for one another without the stipulation of having a relationship. When I hear the word love I don’t think of romance, lovers, boyfriends, or hearts and chocolate. The word love has been commercialized and changed to mean something I don’t believe it means. If we think of our feelings on a spectrum love being on one end and hate being on the other, then love simply means the absence of hate. It is the absence of negativity, hate, pessimism, etc. So with that being said, I think it is crucial and necessary for people to learn to feel this way, because it could very well save our lives.